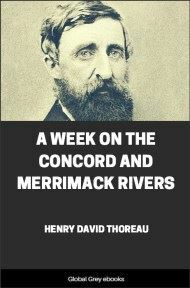 A Week on the Concord and Merrimack Rivers is a book by Henry David Thoreau. 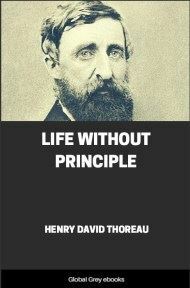 It is ostensibly the narrative of a boat trip from Concord, Massachusetts to Concord, New Hampshire, and back, that Thoreau took with his brother John in 1839. While the book may appear to be a travel journal, broken up into chapters for each day, this is deceptive. 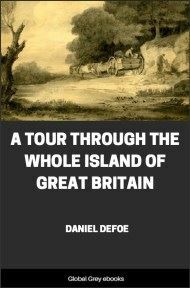 The actual trip took two weeks and while given passages are a literal description of the journey — from Concord, Massachusetts, down the Concord River to the Middlesex Canal, to the Merrimack River, up to Concord, New Hampshire, and back — much of the text is in the form of digressions by the Harvard-educated author on diverse topics such as religion, poetry, and history. At length, on Saturday, the last day of August, 1839, we two, brothers, and natives of Concord, weighed anchor in this river port; for Concord, too, lies under the sun, a port of entry and departure for the bodies as well as the souls of men; one shore at least exempted from all duties but such as an honest man will gladly discharge. A warm drizzling rain had obscured the morning, and threatened to delay our voyage, but at length the leaves and grass were dried, and it came out a mild afternoon, as serene and fresh as if Nature were maturing some greater scheme of her own. After this long dripping and oozing from every pore, she began to respire again more healthily than ever. So with a vigorous shove we launched our boat from the bank, while the flags and bulrushes courtesied a God-speed, and dropped silently down the stream. Our boat, which had cost us a week's labor in the spring, was in form like a fisherman's dory, fifteen feet long by three and a half in breadth at the widest part, painted green below, with a border of blue, with reference to the two elements in which it was to spend its existence. It had been loaded the evening before at our door, half a mile from the river, with potatoes and melons from a patch which we had cultivated, and a few utensils, and was provided with wheels in order to be rolled around falls, as well as with two sets of oars, and several slender poles for shoving in shallow places, and also two masts, one of which served for a tent-pole at night; for a buffalo-skin was to be our bed, and a tent of cotton cloth our roof. It was strongly built, but heavy, and hardly of better model than usual. If rightly made, a boat would be a sort of amphibious animal, a creature of two elements, related by one half its structure to some swift and shapely fish, and by the other to some strong-winged and graceful bird. The fish shows where there should be the greatest breadth of beam and depth in the hold; its fins direct where to set the oars, and the tail gives some hint for the form and position of the rudder. The bird shows how to rig and trim the sails, and what form to give to the prow that it may balance the boat, and divide the air and water best. 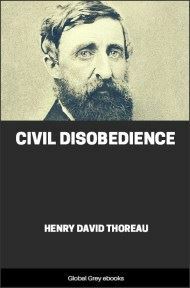 These hints we had but partially obeyed. 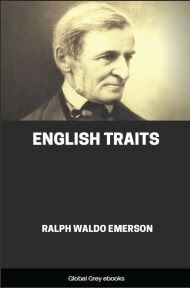 But the eyes, though they are no sailors, will never be satisfied with any model, however fashionable, which does not answer all the requisitions of art. However, as art is all of a ship but the wood, and yet the wood alone will rudely serve the purpose of a ship, so our boat, being of wood, gladly availed itself of the old law that the heavier shall float the lighter, and though a dull water-fowl, proved a sufficient buoy for our purpose. Were vessel safe enough the seas to plough." Some village friends stood upon a promontory lower down the stream to wave us a last farewell; but we, having already performed these shore rites, with excusable reserve, as befits those who are embarked on unusual enterprises, who behold but speak not, silently glided past the firm lands of Concord, both peopled cape and lonely summer meadow, with steady sweeps. And yet we did unbend so far as to let our guns speak for us, when at length we had swept out of sight, and thus left the woods to ring again with their echoes; and it may be many russet-clad children, lurking in those broad meadows, with the bittern and the woodcock and the rail, though wholly concealed by brakes and hardhack and meadow-sweet, heard our salute that afternoon. Down the dark stream which seaward creeps." Our reflections had already acquired a historical remoteness from the scenes we had left, and we ourselves essayed to sing.